Extracorporeal cardiopulmonary resuscitation (ECPR) is the use of rapid deployment venoarterial (VA) extracorporeal membrane oxygenation to support systemic circulation and vital organ perfusion in patients in refractory cardiac arrest not responding to conventional cardiopulmonary resuscitation (CPR). Although prospective controlled studies are lacking, observational studies suggest improved outcomes compared with conventional CPR when ECPR is instituted within 30-60 min following cardiac arrest. Adult and pediatric patients with witnessed in-hospital and out-of-hospital cardiac arrest and good quality CPR, failure of at least 15 min of conventional resuscitation, and a potentially reversible cause for arrest are candidates. Percutaneous cannulation where feasible is rapid and can be performed by nonsurgeons (emergency physicians, intensivists, cardiologists, and interventional radiologists). Modern extracorporeal systems are easy to prime and manage and are technically easy to manage with proper training and experience. ECPR can be deployed in the emergency department for out-of-hospital arrest or in various inpatient units for in-hospital arrest. ECPR should be considered for patients with refractory cardiac arrest in hospitals with an existing extracorporeal life support program, able to provide rapid deployment of support, and with resources to provide postresuscitation evaluation and management. Extracorporeal membrane oxygenation (ECMO) was introduced into clinical practice over 40 years ago, to support patients with advanced but potentially reversible cardiopulmonary failure. Early adoption as a widely accepted support modality occurred in severe neonatal respiratory failure following the publication of prospective clinical trials ,, and in pediatric cardiac failure, particularly in the perioperative environment. , It subsequently became increasingly adopted in pediatric respiratory failure  and adult cardiac support with apparent success but without prospective studies. Use in adults for respiratory failure was not widely adopted until recently, following publication of the CESAR trial  and reports from the H1N1 epidemic suggesting a survival benefit. , At the present time, the most rapidly growing application of ECMO is to provide circulatory support to patients in cardiac arrest following failure of conventional cardiopulmonary resuscitation (CPR) (extracorporeal CPR [ECPR]) to provide a return of spontaneous circulation (ROSC). The higher level of cardiac output support provided by ECPR compared to conventional CPR provides several potential advantages, including a higher rate of successful ROSC, support of postresuscitation cardiogenic shock while arranging and performing coronary interventions, and maintaining organ perfusion during recovery of native cardiac output. The Extracorporeal Life Support Organization (ELSO) maintains a registry of extracorporeal life support (ECLS) cases reported by its member of health-care organizations, which currently number over 300 and represent a global cross-section of ECLS. The number of ECPR cases reported annually to the registry are given in [Figure 1] and the growth in this area of ECLS represents the most rapidly growing segment. The number of actual cases worldwide is likely much higher since the ELSO participation is voluntary and the registry does not capture all cases performed. The term ECPR has been used to refer to the general use of ECLS in the periarrest period, including the use of postarrest cardiogenic shock following conventional resuscitation. ELSO defines ECPR as the use of ECLS in the patient in sustained cardiac arrest without ROSC, or in patients in ROSC may be transient but not sustained. This review adopts the narrower ELSO definition in which ECLS is used before sustained ROSC, in patients experiencing either out-of-hospital or in-hospital cardiac arrest. Management of refractory cardiac arrest with ECPR has the potential to alter some of the above factors. ECPR eliminates the need to achieve ROSC to provide vital organ perfusion. Once the patient is cannulated and extracorporeal flow initiated, perfusion of the brain, myocardium (in nonoccluded coronary arteries), and splanchnic organs is immediately restored, and the postresuscitation low-flow state is eliminated. Improvement in myocardial blood flow enhances the chance of myocardial recovery and return of a spontaneous rhythm or a shockable rhythm more responsive to defibrillation. Introduction of interventions becomes easier. With earlier achievement of adequate systemic perfusion, the risk of neurologic injury may be reduced despite delayed return of spontaneous rhythm. Therapeutic hypothermia can be rapidly achieved and sustained. Coronary interventions are facilitated even if the patient remains in VF since stable perfusion has been achieved. Restoration of coronary perfusion may permit defibrillation or cardioversion of otherwise refractory VF or VT. The success of ECPR relies on early initiation in a patient with the potential for myocardial recovery. There are no prospective studies of ECPR, and no clearly identified selection and initiation criteria for its use in cardiac arrest. The American Heart Association recognizes that at the present time, there is insufficient evidence to recommend routine use of ECPR in cardiac arrest but indicates that it may be considered in settings where ECPR is readily available, blood flow interruption following arrest is brief, and the underlying condition leading to arrest is reversible. The challenges are identifying those patients with reversibility and initiating support sufficiently early. Despite the lack of clear-cut indications, there is a body of experience that can provide guidance for patient selection. A major determinant of outcome following cardiac arrest is the time to return of adequate perfusion, which in conventional CPR is considered to be time to ROSC, and in ECPR is time to initiation of extracorporeal flow. There are observational studies on survival versus time to ROSC following CPR but none following time to ECPR. In in-hospital cardiac arrest, nearly half of patients who had ROSC did so within 10 min of CPR and about 75% within 20 min. Eighty-one percent of those having ROSC within 15 min had good functional recovery. In out-of-hospital cardiac arrest, ROSC occurred within 16 min in nearly 90% of those patients with good functional recovery. After 15 min, good functional recovery was only 2%. These data suggest that CPR should be considered refractory at 15 min. Implementation of ECPR should take place as soon as possible after this time. The target to complete the transition to ECPR is 30 min when possible and no more than 60 min. The determination of reversibility is more challenging. Having a witnessed arrest is important in identifying the exact time of arrest and documentation of time to CPR, which should be within 5 min. A no-flow period of 10 min or longer should preclude ECPR. Once CPR is initiated, it should have been continuous and of good quality, preferably with a mechanical compression device. The etiology of arrest is a clear determinant of reversibility. In out-of-hospital cardiac arrest, the etiology and comorbidities are often unknown. A shockable rhythm suggests an ischemic event with retained myocardial viability and provides strong support for ECPR. A patient in pulseless electrical activity (PEA) poses the most challenge. Patients with known major comorbidity are generally not candidates. Younger patients with a respiratory etiology for arrest and patients with suspected massive pulmonary embolism may be considered. Inpatients usually have a well-characterized diagnosis and known comorbidities. Patients experiencing in-hospital cardiac arrest with known or suspected acute coronary syndrome, suspected pulmonary embolism, or arrhythmia associated with acute ventricular failure who may be ventricular assist device or transplant candidates are candidates. The mode of support for ECPR is VA since other modes (venovenous, arteriovenous) provide gas exchange but not circulatory support, whereas VA support provides both. VA support involves cannulation of the right atrium for venous drainage and the aorta or a large artery (femoral or carotid) for return to the arterial system. The heart and lungs are bypassed during ECPR, and the extracorporeal circuit provides full cardiopulmonary support. On ROSC, systemic blood flow is the sum of native cardiac output and extracorporeal flow. Several cannulation approaches are available, with the choice dictated by the circumstances surrounding cardiac arrest. Cannulation can be central or peripheral. Central cannulation is performed through a median sternotomy, with venous drainage directly from the right atrium or atrial appendage and return to the aortic root. Central cannulation is usually reserved for patients in the postoperative period following a prior median sternotomy for cardiac surgery. Outside of this setting, peripheral cannulation is standard practice. Peripheral cannulation is usually performed through the femoral vessels in adults and adolescents. The femoral site is easily accessible during CPR. A single operator can cannulate both the common femoral artery and femoral vein on the same side. For faster cannulation, one vessel on each side can be cannulated by two operators. Either percutaneous or surgical cannulation can be performed. In pediatric patients, the femoral vessels are of inadequate size for cannulation, and the carotid artery and internal jugular vein are accessed through surgical cutdown. Cannulas used in ECPR must be capable of sufficient flow to provide full circulatory support (at least 4 L/min in the adult). The femoral venous cannula used in adults for percutaneous access is 24-28 Fr and is long enough to reach the right atrium from the femoral insertion site. Adult femoral arterial cannulas are short and range from 16 to 18 Fr. Surgical cannulation of the femoral artery in all cases and percutaneous in many cases will result in limb ischemia, necessitating placement of an antegrade cannula into the superficial femoral artery that can support over 200 mL/min, usually 6-8 Fr in size. When surgical placement is chosen, the cannula size is often chosen based on the observed vessel size. Central cannulation is performed with cannulas used for cardiopulmonary bypass, typically 32 Fr atrial and 24 Fr aortic, with appropriately smaller sizes for pediatric patients. Decannulation following successful return of adequate circulation depends on the cannulation approach. Surgically placed cannulas are removed by surgical cutdown and repair of the vessels. Percutaneous venous cannulas are simply withdrawn, with a horizontal mattress suture straddling the cannula to provide hemostasis. Percutaneous arterial cannula usually requires vessel repair, but withdrawal and manual pressure or a vascular occlusion device used for sizes up to 16 Fr. Decannulation of the centrally cannulated patient requires an operative approach with closure of the sternotomy incision. If long-term support is needed, the patient can be converted to peripheral cannulation to reduce risk of infection and bleeding associated with central cannulation. Extracorporeal circuits incorporating a centrifugal pump and hollow-fiber membrane lung have become the most widely adopted design for extracorporeal support, including ECPR. This circuit design has several advantages. The systems are rapidly primed. The centrifugal pump can provide a controlled negative inlet pressure to facilitate venous drainage. Being afterload dependent, these pumps will not generate very high pressure in the event of an occlusion. Hollow-fiber membrane lungs have low pressure drop and have highly efficient gas exchange, supporting up to 400 mL/min or more of oxygen transfer. Adult circuits incorporate ⅜" inner diameter tubing between all of the components and the cannulas. Centrifugal pumps and adult membrane lungs have ⅜" connectors. Pediatric circuits use ¼" inner diameter tubing. Pediatric membrane lungs have ¼" connectors, but centrifugal pumps are only available in ⅜" size, necessitating step-up connectors. Adult hollow-fiber membrane lungs have rated flows on the order of 7 L/min, more than adequate for most applications. Pediatric membrane lungs have rated flows on the order of 3 L/min. Bleeding is the most common complication associated with all forms of ECLS, including ECPR. The most common site of bleeding is at the cannulation site and is greater following surgical placement than for percutaneous placement. Cannula site bleeding can usually be managed with topical thrombotic agents but may require surgical exploration. Systemic anticoagulation increases the risk of bleeding at other sites, including intracranial and gastrointestinal. Vascular injury during percutaneous insertion can result in failure to cannulate, vascular injury, loss of distal flow, arteriovenous fistulas, and retroperitoneal hematomas. Since ECPR is deployed under time-sensitive circumstances, it could be expected to have a higher complication rate. Failure to achieve adequate extracorporeal flow can be due to inadequate intravascular volume, inadequately sized cannulas (venous in particular), or mispositioning of the cannulas. Ultrasound guidance during percutaneous insertion helps assure proper intravascular placement. Fluoroscopic imaging is helpful for assuring proper positioning but is generally not available during ECPR initiation, but may be helpful once ECPR is initiated. Successful initiation of extracorporeal support may or may not be associated with early return of a stable perfusing cardiac rhythm. Persistence of or development of VF or VT warrants continued aggressive attempts at arrhythmia control with pharmacologic agents, cardioversion/defibrillation, and coronary reperfusion in the case of myocardial ischemia. Persistent PEA is approached with correcting underlying electrolyte abnormalities and acidosis (e.g., with renal replacement therapies). Restoration of myocardial contractility is critical since prolonged stasis of blood in the ventricles and aortic root can lead to clotting of these chambers. Targeted temperature management for postresuscitation hypothermia is easily performed with the extracorporeal circuit. The remainder of post-ROSC management including institution and maintenance of systemic anticoagulation, management of peripheral vascular tone, and management of mechanical ventilation, fluid balance, sedation, etc., is standard for all ECLS and is not detailed here. Survivals in adults reported in literature are similar. A meta-analysis of eleven observational studies in adult patients receiving ECPR following witnessed in-hospital cardiac arrest and failure of conventional CPR found an overall survival to discharge of 40%. The most common diagnosis was acute myocardial infarction. This cohort, however, included patients receiving extracorporeal support for cardiogenic shock immediately following ROSC. With the stricter definition of ECPR applied before ROSC, the survival was higher at 48%, with a mean time of resuscitation of 40 min before initiation of ECPR. This may be due to the earlier institution of ECLS in the pre-ROSC group. A shorter pre-ECPR time (<30 min) was found to be associated with a 1.9 odds of survival compared with a longer time. ECPR is an emerging technology for the management of patients with cardiac arrest refractory to conventional CPR and resuscitative approaches. ECPR is defined as the application of VA ECMO in patients in cardiac arrest who fail to achieve ROSC, or fail to retain ROSC, while undergoing resuscitation. Observational studies suggest that survival with good neurologic recovery may be better with ECPR than with conventional CPR but prospective controlled studies are lacking. Consideration for ECPR is given to individuals with in-hospital or out-of-hospital witnessed cardiac arrest receiving good quality sustained external chest compressions within 5 min of arrest, and in whom ROSC does not return within 15-30 min. Cannulation for ECPR should ideally occur within 30 min of arrest, with up to 60 min considered. A potentially reversible cause of cardiac arrest should be identified, such as a shockable rhythm for out-of-hospital cardiac arrest or a known reversible cause for in-hospital arrest. Both children and adults are candidates for ECPR. Further studies are needed to better define its role and application; however, at the present time, ECPR should be considered in appropriate patients in hospitals with existing ECLS programs. Bartlett RH, Roloff DW, Cornell RG, Andrews AF, Dillon PW, Zwischenberger JB. Extracorporeal circulation in neonatal respiratory failure: A prospective randomized study. Pediatrics 1985;76:479-87. O'Rourke PP, Crone RK, Vacanti JP, Ware JH, Lillehei CW, Parad RB, et al. Extracorporeal membrane oxygenation and conventional medical therapy in neonates with persistent pulmonary hypertension of the newborn: A prospective randomized study. Pediatrics 1989;84:957-63. UK collaborative randomised trial of neonatal extracorporeal membrane oxygenation. UK Collaborative ECMO Trail Group. Lancet 1996;348:75-82. O'Rourke PP, Crone RK. Pediatric applications of extracorporeal membrane oxygenation. J Pediatr 1990;116:393-4. Meliones JN, Custer JR, Snedecor S, Moler FW, O'Rourke PP, Delius RE. Extracorporeal life support for cardiac assist in pediatric patients. 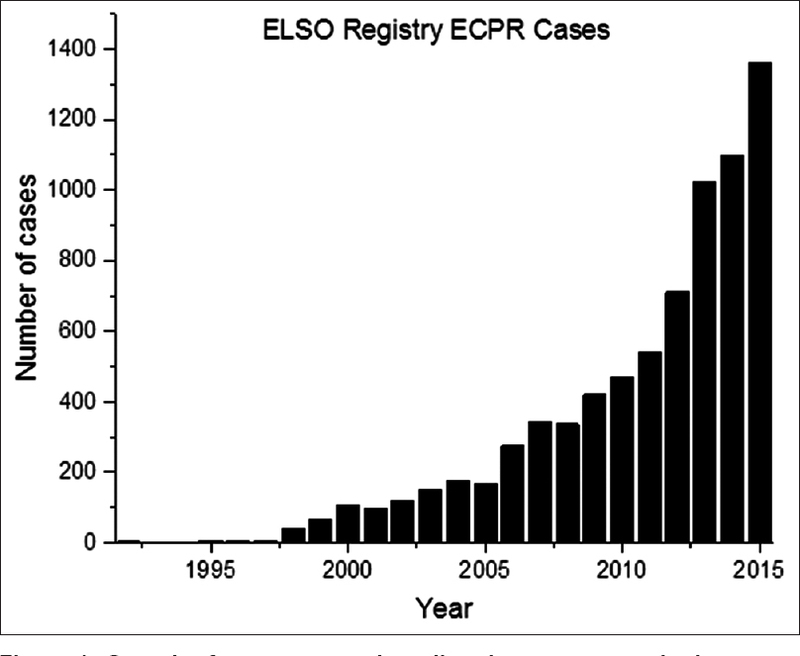 Review of ELSO Registry data. Circulation 1991;84 5 Suppl: III168-72. O'Rourke PP, Stolar CJ, Zwischenberger JB, Snedecor SM, Bartlett RH. Extracorporeal membrane oxygenation: Support for overwhelming pulmonary failure in the pediatric population. Collective experience from the extracorporeal life support organization. J Pediatr Surg 1993;28:523-8. Peek GJ, Mugford M, Tiruvoipati R, Wilson A, Allen E, Thalanany MM, et al. Efficacy and economic assessment of conventional ventilatory support versus extracorporeal membrane oxygenation for severe adult respiratory failure (CESAR): A multicentre randomised controlled trial. Lancet 2009;374:1351-63. Australia-New Zealand ECMO Influenza Investigators, Davies A, Jones D, Bailey M, Beca J, Bellomo R, et al. Extracorporeal membrane oxygenation for 2009 influenza A(H1N1) acute respiratory distress syndrome. JAMA 2009;302:1888-95. Noah MA, Peek GJ, Finney SJ, Griffiths MJ, Harrison DA, Grieve R, et al. Referral to an extracorporeal membrane oxygenation center and mortality among patients with severe 2009 influenza A (H1N1). JAMA 2011;306:1659-68. Extracorporeal Life Support Organization. International Summary of the ECLS Registry. Ann Arbor, Michigan, USA; 2016. Donoghue AJ, Nadkarni V, Berg RA, Osmond MH, Wells G, Nesbitt L, et al. Out-of-hospital pediatric cardiac arrest: An epidemiologic review and assessment of current knowledge. Ann Emerg Med 2005;46:512-22. Schindler MB, Bohn D, Cox PN, McCrindle BW, Jarvis A, Edmonds J, et al. Outcome of out-of-hospital cardiac or respiratory arrest in children. N Engl J Med 1996;335:1473-9. Slonim AD, Patel KM, Ruttimann UE, Pollack MM. Cardiopulmonary resuscitation in pediatric Intensive Care Units. Crit Care Med 1997;25:1951-5. Sandroni C, Nolan J, Cavallaro F, Antonelli M. In-hospital cardiac arrest: Incidence, prognosis and possible measures to improve survival. Intensive Care Med 2007;33:237-45. Nolan JP, Soar J, Smith GB, Gwinnutt C, Parrott F, Power S, et al. Incidence and outcome of in-hospital cardiac arrest in the United Kingdom National Cardiac Arrest Audit. Resuscitation 2014;85:987-92. Niemann JT. Differences in cerebral and myocardial perfusion during closed-chest resuscitation. Ann Emerg Med 1984;13(9 Pt 2):849-53. Weil MH, Tang W. Cardiopulmonary resuscitation: A promise as yet largely unfulfilled. Dis Mon 1997;43:429-501. Martinez JP. Prognosis in cardiac arrest. Emerg Med Clin North Am 2012;30:91-103. Herlitz J, Engdahl J, Svensson L, Angquist KA, Young M, Holmberg S. Factors associated with an increased chance of survival among patients suffering from an out-of-hospital cardiac arrest in a national perspective in Sweden. Am Heart J 2005;149:61-6. Carew HT, Zhang W, Rea TD. Chronic health conditions and survival after out-of-hospital ventricular fibrillation cardiac arrest. Heart 2007;93:728-31. Chan PS, Krumholz HM, Nichol G, Nallamothu BK; American Heart Association National Registry of Cardiopulmonary Resuscitation Investigators. Delayed time to defibrillation after in-hospital cardiac arrest. N Engl J Med 2008;358:9-17. Andersen LW, Berg KM, Saindon BZ, Massaro JM, Raymond TT, Berg RA, et al. Time to epinephrine and survival after pediatric in-hospital cardiac arrest. JAMA 2015;314:802-10. Idris AH, Guffey D, Aufderheide TP, Brown S, Morrison LJ, Nichols P, et al. Relationship between chest compression rates and outcomes from cardiac arrest. Circulation 2012;125:3004-12. Wallace SK, Abella BS, Becker LB. Quantifying the effect of cardiopulmonary resuscitation quality on cardiac arrest outcome: A systematic review and meta-analysis. Circ Cardiovasc Qual Outcomes 2013;6:148-56. Thiagarajan RR. Extracorporeal membrane oxygenation to support cardiopulmonary resuscitation: Useful, but for whom? Crit Care Med 2011;39:190-1. Cave DM, Gazmuri RJ, Otto CW, Nadkarni VM, Cheng A, Brooks SC, et al. Part 7: CPR techniques and devices: 2010 American Heart Association Guidelines for Cardiopulmonary Resuscitation and Emergency Cardiovascular Care. Circulation 2010;122 18 Suppl 3:S720-8. Goldberger ZD, Chan PS, Berg RA, Kronick SL, Cooke CR, Lu M, et al. Duration of resuscitation efforts and survival after in-hospital cardiac arrest: An observational study. Lancet 2012;380:1473-81. Walpoth BH, Locher T, Leupi F, Schüpbach P, Mühlemann W, Althaus U. Accidental deep hypothermia with cardiopulmonary arrest: Extracorporeal blood rewarming in 11 patients. Eur J Cardiothorac Surg 1990;4:390-3. Fagnoul D, Combes A, De Backer D. Extracorporeal cardiopulmonary resuscitation. Curr Opin Crit Care 2014;20:259-65. Wanscher M, Agersnap L, Ravn J, Yndgaard S, Nielsen JF, Danielsen ER, et al. Outcome of accidental hypothermia with or without circulatory arrest: Experience from the Danish Præstø Fjord boating accident. Resuscitation 2012;83:1078-84. Kolcz J, Pietrzyk J, Januszewska K, Procelewska M, Mroczek T, Malec E. Extracorporeal life support in severe propranolol and verapamil intoxication. J Intensive Care Med 2007;22:381-5. Daubin C, Lehoux P, Ivascau C, Tasle M, Bousta M, Lepage O, et al. Extracorporeal life support in severe drug intoxication: A retrospective cohort study of seventeen cases. Crit Care 2009;13:R138. St-Onge M, Fan E, Mégarbane B, Hancock-Howard R, Coyte PC. Venoarterial extracorporeal membrane oxygenation for patients in shock or cardiac arrest secondary to cardiotoxicant poisoning: A cost-effectiveness analysis. J Crit Care 2015;30:437.e7-14. Conrad SA, Grier LR, Scott LK, Green R, Jordan M. Percutaneous cannulation for extracorporeal membrane oxygenation by intensivists: A retrospective single-institution case series. Crit Care Med 2015;43:1010-5. Burrell AJ, Pellegrino VA, Sheldrake J, Pilcher DV. Percutaneous cannulation in predominantly venoarterial extracorporeal membrane oxygenation by intensivists. Crit Care Med 2015;43:e595. Bellezzo JM, Shinar Z, Davis DP, Jaski BE, Chillcott S, Stahovich M, et al. Emergency physician-initiated extracorporeal cardiopulmonary resuscitation. Resuscitation 2012;83:966-70. Bistrussu S, Beeton A, Castaldo G, Han J, Wong I, Tuleu C, et al. Are extracorporeal membrane oxygenation circuits that are primed with plasmalyte and stored a likely source of infection? J Clin Microbiol 2004;42:3906. Weinberg A, Miko B, Beck J, Bacchetta M, Mongero L. Is it safe to leave an ECMO circuit primed? Perfusion 2015;30:47-9. Chan T, Thiagarajan RR, Frank D, Bratton SL. Survival after extracorporeal cardiopulmonary resuscitation in infants and children with heart disease. J Thorac Cardiovasc Surg 2008;136:984-92. Alsoufi B, Al-Radi OO, Nazer RI, Gruenwald C, Foreman C, Williams WG, et al. Survival outcomes after rescue extracorporeal cardiopulmonary resuscitation in pediatric patients with refractory cardiac arrest. J Thorac Cardiovasc Surg 2007;134:952-9.e2. Prodhan P, Fiser RT, Dyamenahalli U, Gossett J, Imamura M, Jaquiss RD, et al. Outcomes after extracorporeal cardiopulmonary resuscitation (ECPR) following refractory pediatric cardiac arrest in the Intensive Care Unit. Resuscitation 2009;80:1124-9. Kelly RB, Harrison RE. Outcome predictors of pediatric extracorporeal cardiopulmonary resuscitation. Pediatr Cardiol 2010;31:626-33. Huang SC, Wu ET, Wang CC, Chen YS, Chang CI, Chiu IS, et al. Eleven years of experience with extracorporeal cardiopulmonary resuscitation for paediatric patients with in-hospital cardiac arrest. Resuscitation 2012;83:710-4. Cardarelli MG, Young AJ, Griffith B. Use of extracorporeal membrane oxygenation for adults in cardiac arrest (E-CPR): A meta-analysis of observational studies. ASAIO J 2009;55:581-6. Chen YS, Lin JW, Yu HY, Ko WJ, Jerng JS, Chang WT, et al. Cardiopulmonary resuscitation with assisted extracorporeal life-support versus conventional cardiopulmonary resuscitation in adults with in-hospital cardiac arrest: An observational study and propensity analysis. Lancet 2008;372:554-61. Blumenstein J, Leick J, Liebetrau C, Kempfert J, Gaede L, Groß S, et al. Extracorporeal life support in cardiovascular patients with observed refractory in-hospital cardiac arrest is associated with favourable short and long-term outcomes: A propensity-matched analysis. Eur Heart J Acute Cardiovasc Care 2015. pii: 2048872615612454. Ruttmann E, Weissenbacher A, Ulmer H, Müller L, Höfer D, Kilo J, et al. Prolonged extracorporeal membrane oxygenation-assisted support provides improved survival in hypothermic patients with cardiocirculatory arrest. J Thorac Cardiovasc Surg 2007;134:594-600.